In the previous article in this series, The Earth’s Energy Budget – Part Two we looked at outgoing longwave radiation (OLR) and energy imbalance. At the end of the article I promised that we would look at problems of measuring things and albedo but much time has passed, promises have been forgotten and the fascinating subject of how the earth really radiates energy needs to be looked at. If you are new to the idea of incoming (absorbed) solar radiation being balanced by OLR, or wonder how the solar “constant” of 1367W/m2 can be balanced by the earth’s OLR of 239W/m2 then take a look at Part One and Part Two. If these kind of comments confuse you, sound plain wrong, or cause you to furrow your brow because “it sounds like it’s probably right but what does it actually mean?” – well, hopefully some enlightenment can be found. In this figure there are two spectra: the top one is how the sun’s radiation looks before it reaches the top of the earth’s atmosphere – contrasted with the dotted line of a “blackbody” – or perfect radiator – at 5780K (5507°C for people new to Kelvin or absolute temperature). The bottom one – of less interest for this article – is how the sun’s radiation looks at the earth’s surface after the atmosphere has absorbed at various wavelengths. Why don’t we see a radiation spectrum from the sun that matches millions of degrees? If we measure the upward longwave radiation from the earth’s surface at 15°C we see an effective “blackbody” radiator of 288K (15°C). But why don’t we see a radiation spectrum of 5000K – the temperature somewhere near the core? The answer to both questions is that radiation from the hotter inner areas of these bodies gets completely absorbed by outer layers, which in turn heat up and radiate at lower temperatures. In the case of the sun, the radiation spectrum includes hotter areas below the surface that are not absorbed at some wavelengths, as well as the surface itself. In the case of the earth it’s really the top skin layer that emits longwave radiation. So when we measure the radiation from the earth with a surface temperature of 15°C (288K) we know we will see a longwave radiation that matches this 288K. This will be a total energy radiated of 390W/m2 with the peak wavelength of 10.1μm. The temperature below the surface is irrelevant. (Well, it’s not really irrelevant. The hotter layers below warm up the layers above – through conduction and radiation). This assumes an emissivity of 1. The emissivity of the surface of the earth varies slightly but is close to 1, typically around 0.98. Watch out for a dull post on emissivity at some stage..
At the top of atmosphere, as many know, the OLR is around 239W/m2. For those confused by how it can be 390W/m2 at the surface and 239W/m2 at the top, the answer is due to absorption and re-radiation of longwave radiation by trace gases – the “greenhouse” effect. See the CO2 – An Insignificant Trace Gas? series, and especially Part Six – Visualization and CO2 Can’t Have that Effect Because.. if you don’t understand or agree with these well-proven ideas. If the earth’s atmosphere was completely transparent to longwave radiation this spectrum would look exactly the same at the earth’s surface and at the top of atmosphere (TOA). (Note that the spectrum is shown in wavenumber in cm-1. For convenience I added wavelength in μm under the wavenumber axis. Wavelength in μm = 10,000/wavenumber). For energy balance – if the earth is not warming up or cooling down – we would expect the earth to radiate out the same amount of energy that it absorbs from the sun. That amount is 239W/m2, which equates to an average temperature of 255K (-18°C). As the text for this graphic shows, when the energy under the curve is integrated this is what it comes to! 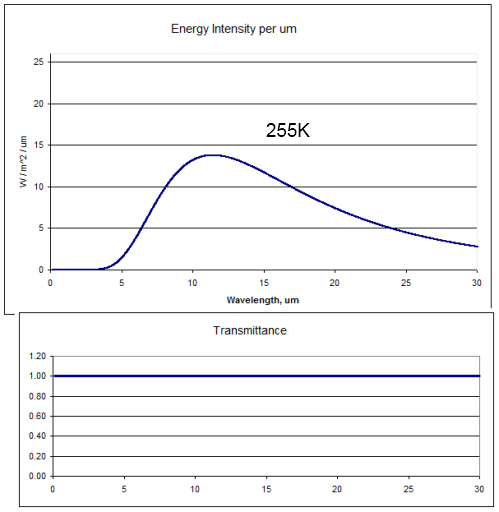 But as you can see the actual spectrum is not a “blackbody curve” for 255K. So let’s take a closer look. Imagine a world where the upwards longwave radiation from the earth’s surface didn’t get absorbed by any gases in the atmosphere. This is the blackbody radiation at 255K (-18°C) with 100% “transmittance” through the atmosphere. The area under the curve, if we extend it out to infinity, is 239W/m2. And of course, because the radiation hadn’t been absorbed or attenuated in any way, the temperature at the earth’s surface would also be 255K. Chilly. The bottom graph shows how the transmittance of the atmosphere varies with wavelength in this thought experiment. 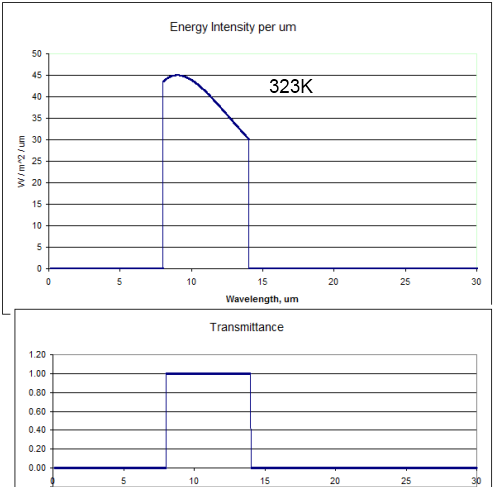 The top graph in this case is the blackbody radiation from 323K (50°C) only allowed through between 8-14μm. 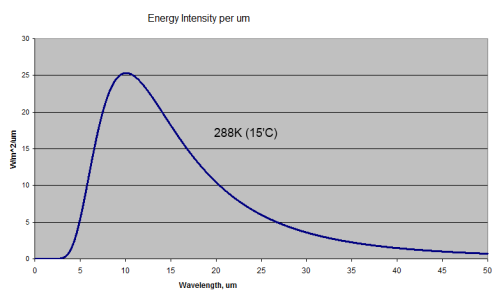 The energy under the curve is 239W/m2. (Note the higher values on the vertical scale compared with the earlier graphs). So if the atmosphere absorbed all of the surface radiation below 8μm and above 14μm the earth’s surface would heat up until it reached 50°C (323K). Why? Because if the temperature was only 15°C the amount of energy radiated out would only be 141W/m2. More energy coming in than going out = earth heats up. The surface temperature would keep heating up until eventually 239W/m2 made it out through the atmospheric window – which is 50°C. Even in the atmospheric window some radiation is absorbed, i.e. the transmittance is not 1. But let’s assume for sake of argument it is 1. So energy in the 8-14μm band just passes straight through the atmosphere. It’s still a thought experiment. Lots of gases absorb at lots of wavelengths – which makes thinking about it as a whole very difficult. So we’ll just assume that the rest of the atmosphere outside the atmospheric window all shares the same absorption characteristics – that is, every wavelength is identical in terms of absorption of radiation. The highlighted area at the bottom – the troposphere – is the area of interest. This is where most of the atmosphere (by molecules and mass) actually resides. In our thought experiment radiation from the surface (outside the atmospheric window) gets completely absorbed by the atmosphere, or at least the amount that gets through is very small. Taken to the extreme we would get the result shown a few graphs earlier where the surface temperature rises up to 50’C. But just because surface radiation doesn’t get out doesn’t mean that radiation from the atmosphere can’t get out. Each layer of the atmosphere radiates according to its temperature. Even if the atmosphere’s transmittance is zero when considering the entire thickness of the atmosphere, there will be some layer where radiation starts to get through. This is partly because there is less atmosphere to absorb the closer we get to the “top”. And also because as we get higher in the atmosphere it gets thinner. Less molecules to absorb radiation. Even if some gas is a fantastically good absorber of energy, there must be a point where radiation is hardly absorbed. For example, at the top of the stratosphere, about 50km, the pressure is around 1mbar – 1000x less than at the surface. At the top of the troposphere (the tropopause) the pressure is around 200mbar – 5x less than at the surface. But let’s still keep it simple and think about the surface temperature being our standard 15°C (288K) and the atmospheric window letting through everything between 8-14μm. This means 141W/m2 makes it out through this window. If we have energy balance, the OLR = 239W/m2 in total = 141 (through the atmospheric window) + 98 (radiated from the atmosphere at some height, wavelengths outside 8-14μm). What temperature equates to this layer in the atmosphere? Well, assuming no absorption above this radiating layer (not really the case), and only radiation outside 8-14μm, the temperature of the atmosphere would have to be 219K, or -54°C. Take a look back at the temperature profile above – this is pretty much the top of the troposphere, around 11km. Remember that this isn’t exactly how radiation gets radiated out to space – it doesn’t come from one “skin layer”. We might consider that if the transmittance of the atmosphere is 1 at this height, then maybe at 10km the transmittance is 0.8 and at 9km the transmittance is 0.5, and at 8km the transmittance is 0.1.. So each layer is radiating energy, with higher layers being colder but more of their radiation getting through, and lower layers being warmer – so radiating a higher amount – but less of their radiation getting through. For many people reading, this is a straightforward concept, why so long.. for others it might still seem tough to grasp..
What the diagram shows is the radiation outside the 8-14μm band. That’s because in our thought experiment the 8-14μm band doesn’t absorb any radiation (and therefore can’t radiate in this band either). Take the top layer at 11km. If we calculate the blackbody radiation of 219K (-54°C) and exclude radiation in the 8-14μm band the radiation is 98W/m2. Then the grey block above with “0.6” is the atmosphere above with transmittance of 0.6, so the radiation actually getting through from this layer to the top of atmosphere is 59W/m2. Similarly for the two other layers (with different values). In total, the energy leaving the top of atmosphere (outside of the atmospheric window) is 98W/m2. (It’s just a coincidence that this is the value of the top layer before any absorption). And inside the atmospheric window was the number we already calculated of 141W/m2, so the total OLR is 239W/m2. Of course, we all know the real atmosphere is much more complex with lots of different absorption at different wavelengths. But hopefully this “intermediate” example help to explain how the atmosphere radiates out energy. So finally, onto the real point..
What Happens with More Absorbing Gases? Remember how this long post started..
Now, maybe this kind of statement will make more sense. In our model – our thought experiment – above, we had a uniform absorber of radiation outside the atmospheric window. Suppose we increase the amount of this absorber – the skies open and someone pours some more in and stirs it around. Let’s say the amount increases by 10%. Well, take a look back at the last diagram. 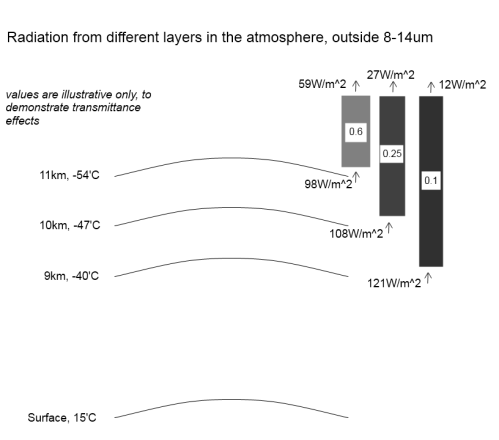 See the transmittance values for each layer in the atmosphere – 0.6 at 11km high, 0.25 at 10km high and 0.1 at 9km high. Regardless of how realistic these actual numbers are, increasing the amount of absorbing gas by 10% will automatically mean that each of the transmittance numbers is reduced by 10%. And so less radiation makes it out to the TOA (top of atmosphere). Effectively because lower layers are contributing less energy out through TOA the effective radiating height has moved up. It’s not because some directive has been passed down from a higher authority. And it’s not because one layer has stopped and another layer has taken over. It’s just that lower layers contribute less, so the “average radiating height” is now higher and colder. (Note: it might look at first sight that the average height is still the same even though the amount of radiation has reduced. This is not really the case, see the note at end). In our particular example what would happen is that the OLR would reduce from 239W/m2 down to 141+98*0.9=229 W/m2. So the surface would warm up and this would warm up each layer of the atmosphere until eventually a new hotter steady state was reached. This has been a long post to try and create more of an understanding of how the earth actually radiates energy, and why more of any trace gas increases the “greenhouse” effect. It does it because more “absorbing gases” reduce the amount of radiation that can make it out from lower layers in the atmosphere. These lower layers are hotter and radiate much more energy. Proportionately more energy will then be radiated from higher layers which are colder, and therefore these radiate less energy. It’s a not a mystical force that raises the “effective radiating height” in the atmosphere. But the effective radiating height does increase. In the example above, the three layers together contributed 98W/m2 at TOA. That is an “effective temperature” of 219K – remembering that we are excluding radiation from the 8-14μm window. If we reduce the radiation from these three layers by 10%, we now have 89W/m2 which is about 212K – effectively radiating from a colder level in the atmosphere. That was really nice. I just read something precisely on the topic, too. You’re as good as having Asimov for a neighbor. I love the integrated presentation – for me it’s eminently digestible. quibble, sorry, but this one sentence is a bit ambiguous, though it’s all clear in the rest. A serious question, though – why should this be expected to affect surface temperatures very much, if convection and turbulence change the lower layer within which most of the IR is absorbed? My window is an infinite heat sink (for this game, as if it were a finned radiator out in space). My breath condenses on it. The water runs down. The temperature reading is X. If 2 people are in the room, more breath condenses and more water runs down. The temperature reading is X still because in this game the window is an infinite heat sink. The warmer the room gets, the more I sweat and the more water condenses on the window. My temperature doesn’t change and the temperature of the window remains X. Can you have a go at this? I’m basically seeing the ocean as a great heat sink with fuzzy fins out to space, you see. What computes is that adding heat capacity to the working fluid would improve the efficiency of the heat flow rather than stifle it. The red circled area resembles the saturation temperature profile of a refrigerant, btw. Is that pure coincidence? The critical temperature profile of water is fixed, so I wouldn’t expect a change in blackbody spectrum with additional heat to the system (not talking about heat capacity), but instead, more of it. Up near the top, there is a typo, I think. You refer to the temperature of the Sun near its center — this should be 15 million K, not 5000 K.
Also, I am a bit puzzled as to why you try to draw such a distinction between the emergent spectrum of our Sun compared to that of our Earth. The physics of the formation of the emergent spectrum is essentially the same. The differences in the two emergent spectra arise from the vastly differing temperatures and opacity sources (because of differences in elemental composition and gas temperatures). For example, it turns out that the Sun does not have a “window” to its central core (lucky us) to allow that radiation to exit from that layer virtually unscathed. But it is still the case that each wavelength of emergent light intensity exits from its own “window” down to some physical depth the Sun’s photosphere — the thin surface layer from which light emerges from the Sun, leaving the matter behind. where I’ve replaced the “sum of” with an “integration of” in taking fine continuous steps, d(tau_lambda), from the surface through layers in the atmosphere, and tau_lambda is the wavelength-dependent optical depth measured from some layer (whose temperature is T) to the top of the atmosphere. The higher the temperature, the more intense the blackbody spectrum is. As you noted above the temperature T varies from Earth’s surface to the TOA, diminishing with height from the surface through the troposphere. It just so happens that Earth’s atmospheric opacity between 8-14 microns is very small, thereby allowing the generally much warmer (and so brighter) thermal radiation emitted by Earth’s surface (land, oceans, etc) to escape directly. Earth’s atmosphere emits very little light in that window. Oops. I just realized that in the post above I should have defined the function “exp(-tau_lambda)” in the equation I gave. This is the exponential function, with ‘e’ as its base. So it’s the same as e[sup]-tau[/sup] (omitting the notation of wavelength dependence of tau), where e’s natural logarithm ln (e) = 1. And I should have complimented you on what overall was an excellent tutorial. Keep up the good work! Thanks Science, for another outstanding post. Thanks for pointing out the ambiguity, I have fixed up the text. A very interesting question. Convection is more effective than radiation at moving heat in the “optically thick” lower atmosphere. As we move to “optically thinner” layers of the atmosphere radiation becomes more effective than convection. So convection determines the temperature profile of the lower atmosphere – the atmospheric lapse rate. But how does energy make it out of the atmosphere? Regardless of the profile of the lower atmosphere, if energy doesn’t get radiated out to space then more energy is incoming compared to outgoing. And so the whole atmosphere will heat up. The lapse rate will determine the “slope of temperature” – i.e. how the energy is distributed in the lower atmosphere. But the effectiveness of the atmosphere at radiating into space will determine the total amount of energy in the climate system. And for your further comments this explanation still applies. If all the energy in the climate system was effectively radiated out to space from the surface – it would be a different story. Looking at the energy transfer in longwave IR, I hope it is correct to assume that a ‘small’ parcel of gas is effectively a black-body – that is all active molecules are at radiative balance with each other. My first question is what is the mean distance a longwave IR photon travels in the atmosphere before being absorbed again? That is in lower atmosphere and at a few selected heights above? I also understand that humidity will vary that pathlength – but by how much at different levels? Next I assume in an isothermal density gradient that as the gas gets less dense the photons travel further before being trapped? And that at the edge of space they simply don’t get trapped at all and keep on going. First appearances to me is that photons / radiant energy would ‘flow’ towards less dense gas and space – at increasingly higher rates of travel – instead of towards denser gas at increasing slower rates of travel? Finally – I see you said that in the lower atmosphere convection transfers more energy than radiation? How is this possible when radiation is so much faster? Or is the answer to the mean photon pathlength above relevant? If so – how long does it take for energy to radiantly escape from the earth to outerspace? I hope it is correct to assume that a ’small’ parcel of gas is effectively a black-body – that is all active molecules are at radiative balance with each other. A blackbody is one that absorbs (and therefore emits) 100% of radiation across all wavelengths under consideration. Generally, no gas radiates as a blockbody. They have wavelengths where they absorb and radiate strongly and other wavelengths where they absorb nothing and radiate nothing. This doesn’t impact on the slightly confusing: “all active molecules are at radiative balance with each other”. Generally we can’t say too much about individual molecules. We might be able to generalize about a gas or mix of gases that include a lot of molecules. I skipped some questions here in case the last answer sheds light on the earlier questions.. Finally – I see you said that in the lower atmosphere convection transfers more energy than radiation? How is this possible when radiation is so much faster? It doesn’t matter how fast the photons travel. The equilibrium temperature profile would be determined by the absorption and re-radiation. Absorption increases as the amount of absorbing gas increases. Radiation from absorbing gases increases as the temperature increases. Photon speed doesn’t come into it. By contrast, convection moves large amounts of air due to the fact that solar radiation warms the bottom of the atmosphere, which therefore expands, and therefore rises. — Given my answer to this last part, are your earlier questions still valid because I didn’t really understand them, and perhaps the relevance of photon speed is the problem. Anyhow, feel free to ask away. Anyway this is from a satellite scan over the Mediterranean Sea, with the effects of various gases segregated (as far as possible! ) It is immediately clear that the radiation envelope across the two windows centred at 9 and 12 micrometers corresponds to a radiation temperature of about 12C – as you would expect from the surface of the Med. -, while the radiation from the CO2 band at 15 micrometers corresponds to -53C. 2. Re-radiation – I think it’s worth noting that if a particle absorbs a photon of energy ( if a gas molecule absorbs a quantum of radiation) it can only re-radiate that energy as one or more photons of equal or less energy. Photons of lower energy have (in effect) lower temperatures and longer wavelengths. This is caused by the laws of physics. Consider a photon which has a wavelength in the CO2 band, leaving the earth’s surface. It will not get far till it’s absorbed by a CO2 molecule. The excited molecule, now travelling a bit faster, will in due course emit another photon, with lower energy and a greater wavelength, perhaps after hitting another gas molecule. A lot of this goes on till eventually, all the energy carried by photons which get absorbed by CO2, will re-appear as photons of greater wavelength. This can take the photons right out of the CO2 absorption band and allow it the radiation to escape into space as photons of much lower energy than left the surface, and of course lower energy implies lower temperature. For a sort of analogy, think of water running down a gutter and coming to a grating over a drain. The bars of the grating restrict the water from flowing in, so that it there is a big flow, some water may have to traverse the whole grating before it gets away. This means that the depth of water on the side of the grating where the flow comes from, will increase with the rate of flow, even if all the incoming water does go down the drain. In the same way, the atmospheric temperature increases when the outflow of heat is obstructed, even though all the heat coming in eventually gets out again! 3. The Lapse Rate – Why does the air get colder as you go up? Is it because greenhouse gases are making it warmer near the surface? Is it because clouds are keeping the heat in? Is it because the upper parts of the atmosphere are radiating all the heat away? Is it because of convection, or the latent heat of water vapour, or what? P. M. Bellan, A microscopic, mechanical derivation of the adiabatic gas relation, American J. Phys. 72, 679 (2004). In the atmosphere, this change is called the adiabatic lapse rate. If there were no water vapour, it would be about 10C per km., but with water vapour and all the actual things that go on in the atmosphere, such as those mentioned above, the lapse rate is in practice about 6.5C per km. All this has NOTHING AT ALL TO DO with the greenhouse effect, but you can see that since the two effects exist alongside each other, it is very easy to get them confused. Thought I would just like to make this quite clear. At some point in the discussion, I’m hoping things will come around to the solar powered heat pump that is the atmosphere and treat the neglected topic of phase change which has a few major influences quite apart from aerosol effects. The atmosphere is a dynamic system pumping heat; there is a constant flow. Efficiency of heat transport is a matter of the critical temperature of the working fluid and the molar heat capacity. Increasing the heat capacity of the working fluid should not raise the temperature. It should reduce flow rate. That’s what happens in a refrigeration unit. Radiative effects are considered, really, only on the radiator end. Between the heat source and the sink, you have your saturation temperature profile = lapse rate. If your sink stays at a given temperature, no temperatures in the system are affected. Instead, the rate of flow changes. It slows with an increase in efficiency. If CO2 is the culprit in warming, OLR should increase before reaching equilibrium as explained in Part 2, but this has not been measured as far as I am aware. If you add CO2, as an immediate effect less longwave radiation leaves the top of atmosphere (TOA). Therefore, more energy comes in than leaves, therefore, temperatures increase. Second, the idea in part two defines moving from equilibrium through a warming phase back to a new equilibrium. So is it fair to say, then, that it is this (moist) adiabatic lapse rate that drags the surface temperatures upward as the lower troposphere warms? I need the calculator again for this one. By Avogadro, the ideal gas constant has the same value for all gases, so PVT = PVT regardless of the molecule. In 1000 liters of air, at STP there are 1000/24.45 = 40.9 moles. As in a previous illustration, let the water component be 1% = 10 liters = 4.09 moles. It doesn’t matter what the other gases are for this. At the critical temperature of water vapor, this 10 liters condenses and occupies 4.09 * 18g * 1g/cc = 736.20 cc. So the 1000 liters of air would now be 990.74 liters. To get a 1% pressure drop by changing the temperature alone you need to do from 298 to 292.04 = 5.96 degrees. So- does the atmospheric profile reflect what is expected for a dry gas or is it the profile of a refrigerant, i.e., dominated by phase change saturation profile? The moist adiabatic lapse rate is a complex equation which depends strongly on the atmospheric temperature. At higher temperatures the saturated lapse rate can fall as low as 0.35 x dry lapse rate. The environmental lapse rate – what we experience in practice – averages at -6.5K/km (but it varies a lot). So the temperature profile in the troposphere is strongly affected by latent heat. That’s how some people explain it. When you first asked the question I just saw it as a “handy mental picture”. But now I’m thinking that – all other things being equal – this is what happens. All other things won’t be equal, but at least we can say we understand how this bit works in isolation (I hope). I guess there is also a special case where a thunderstorm creates a sort of pipe straight from surface to stratosphere that virtually bypasses any interaction with co2 or IR input once it’s got going. Is such a system dependent on convection at all? To be sure, convection is not opposing it and would assist it, but latent heat and phase change suffice. Given my answer to this last part, are your earlier questions still valid because I didn’t really understand them, and perhaps the relevance of photon speed is the problem. The question about effective photon speed was to try and understand the energy flux out of the atmosphere. I understand in the sun a photon takes thousands of years to reach the surface and be emitted. If the radiative emission / absorbtion processes in the lower earth’s atmosphere require each photon to be absorbed and remitted many many times, each time traveling some miniscule distance than it may take hours or days for that photon to eventually reach upper atmosphere and escape. I have no idea how long that process takes and I thought it might be relevant to your comment about convection being much more powerful than radiation. The real reason convection dominates is not due to the photon absorption time. I will try and get around to writing a post about convection and radiation and see if that helps. I’d suggest that photon absorption time may be significant. Simply because air temperature doesn’t plummet once the sun goes down. The transfer of energy from soil to air is far too slow to keep air temperature at a stable level so air must be a very poor radiator. In fact, it’s the soil that cools fastest at night while the atmosphere stays at pretty constant temperature – hence the development of inversions. There is obviously little radiative transfer between lower atmosphere and the soil, and there appears to be little radiative transfer between lower atmosphere and the ‘sky’ – all these are subject to the caveat of the time scale of around 12 hours of non-sun. So my question stands rephrased. What is the actual radiative flux in the lower atmosphere based on radiation from gas parcel to gas parcel? My second question is perhaps related. Why does the soil cool fastest while the atmosphere 10m above cools very slowly if at all? Is it a difference in radiation spectrum or some other effect? Convection is more effective than radiation, nothing due to photon times.. If we had no convection ever then the temperature profile in the atmosphere would be much “lower”, instead of -6.7K/km it might be -13K/km. If photons were 1000000 times faster it would be the same. Needs a new post to address these questions, I think. If we had no convection ever then the temperature profile in the atmosphere would be much “lower”, instead of -6.7K/km it might be -13K/km. I thought – though I expect to be corrected – that the wet and dry lapse rates were purely functions of basic gas laws and convection was not a factor. I base this on the fact that all the standard meteroological diagrams ( searches long lost neurons for tephigrams ) do not have any correction for convection but do account for water content. The wet and dry lapse rates explain convection. Why does a parcel of gas rise? Why does another one sink? Why does another one stay at constant height? All because of their lapse rate compared with the existing atmospheric lapse rate. So, convection dominates the lower atmosphere because the basic gas laws determine that this effect is more effective at moving heat around than radiation. The wet and dry lapse rates explain convection. I’m not sure this is a good answer. In a stable atmosphere the lapse rate is fixed – wet or dry. Agreed – and when you introduce parcels of gas with different temperature and water content then yes, they will move till their buoyancy is equilibriated (yuk – horrid word). Even then they will move a bit more due to momentum factors and gravity effects. The wet and dry lapse rates set the energy profile of the atmosphere. Convection is a result of introducing differential energy at specific locations. This will then cause motion. In the example I referred to – where the surface cools but not the atmosphere – you have an instance of convection not dominating and a clear absence of radiation causing equilibrium. I again ask the question as to the time scale of radiation of energy from gases? If it was quick then there would be no development of an inversion. If it is slow then inversions are quite possible. The only other alternative is a distinct difference in radiation profile between ‘soil’ and air. Given you simply use Boltzman profiles I expect this difference is not considered? A big subject, I will do a post on it.. watch out for it. I’ll just add a small amplifier of my point before I go off to make tea. With inversions it’s obvious that the soil is very much more in radiative equilibrium with the sky than the gas immediately above it even though both are at similar temperatures. It’s almost as though the soil has a transparent window to the sky above it and radiates freely, while the gas a few metres above allows radiation through but at no stage even starts to equilibrate with the sky. They are both at similar temperatures. They should both radiate in similar ways but they don’t. Is the difference between the soil radiation spectrum and the atmosphere radiation spectrum significant? Are they essentially independent? Does the fact that the atmosphere does not quickly equilibriate with the sky mean that the flow of energy at ‘atmospheric frequencies” is severely diminished? The soil will radiate at close to “blackbody” (perfect) radiation. But the atmosphere can only radiate in frequencies at which it can also absorb, which are limited, and definitely nothing close to a blackbody. In radiation terms – “somewhat”. The reason for saying “somewhat” is that the atmosphere will absorb radiation from the ground. Otherwise, in terms of latent (evaporation of water) and sensible (conduction and boundary layer convection) heat, they are not independent, they share energy freely. First, soil absorbs in frequencies that match its chemical composition and surface texture and then re-radiates temperature shifted. Soil which appears ‘black’ at visible frequencies can be pretty ‘shiny’ and non-radiative at longwave IR frequencies. Second, I used the term black body in relation to the gas radiation a bit too glibly. I understand the QM absorbtion and emission varies at different frequencies, but the net effect is still the same. Radiation between parcels of gas may be restricted to specific bands but to a close approximation they will be in radiation equilibrium – a poor mans black body. As I understand it, the earth radiates to some (limited) extent in the long wave IR range. The frequencies that don’t get absorbed well can escape. The others interact with the atmosphere. From your graphs I would expect the large majority of the earth LW radiation to be captured and only a small portion escape. What I see from practical observation is that the soil radiates very strongly and there appears to be very little interaction with the atmosphere. Just another point relating to my post on another thread. I’m quite interested in the mean free path of a photon and the escape time of a photon from the earth surface to space. If the CO2/H20 gas is somewhat like an impenetrable fog, the the time for a photon (of the right frequency) from being emitted from the soil or lower atmosphere to finally escape is interesting. It may be microseconds, or it may be a much longer time. I really have no idea. I guess it depends on the probability of being absorbed by a CO2/H20 molecule in a specific distance, and then the dwell time before being re-emitted. In the end it will define the energy flux from the surface. To give a practical example. Assume night, assume clear sky. A LW CO2/H20 peak photon is emitted from the lower atmosphere. It takes microseconds to escape to outer space. In effect the surface and lower atmosphere gases become in thermal equilibrium with the sky – 2-3K. It suddenly gets frikken freezing. So now take the example where it takes hours or days to escape. At night it might get a bit chilly, but not very much. So my take is it takes a long time for photons (energy) to escape. My question is how long? And a final sally re my previous posts. I’m betting that most – if not all – climate models don’t account for photon transit time. I’d be really pleased to find out the contrary, but I somehow doubt it. The effect of longer photon transit time is to modify the energy flux and change temperature differentials. Effectively putting a layer of insulation between different climate locii. Now it may be that the models work at time scales that minimise this effect. It may also be that they don’t and we have some interesting effects to model. The general equilibrium response of an atmosphere determined by radiative effects is in the order of a few months. That is, if the atmospheric temperature profile was determined by radiation only, and we changed a factor like solar irradiance, or CO2 concentration – the atmosphere would move to a new equilibrium within a few months. But the atmospheric profile is determined by convective processes. I really should go and make tea now, but for the sake of argument. In a night-time still air situation radiation processes dominate. At night the air at ground level gets cold while the air above stays warm. In this case I know it with certainty as I have done many night-time field trips flying sondes to measure the vertical air profile up to hundreds of metres. At night within a few hundred metres of ground level radiation effects dominate. You should probably try to use the meteorologists convention that lapse rate is positive when it decreases with altitude to avoid confusion. The reason that radiation dominates on a clear, still night is that when the surface cools faster than the air above it, you get what meteorologists call a temperature inversion. i.e. the temperature increases with altitude. A temperature inversion blocks convection because the air below is denser than the air above. The same thing happens at the tropopause. People in Los Angeles know all about temperature inversions. The trapping of air in the LA basin by frequent temperature inversions is why LA had smog before anyone else. You could easily see the demarcation when flying into LA. The top of the smog layer was almost perfectly flat and very sharp, sort of like the thermocline in the ocean. Let mee see if I understand this. Earth is not a perfect black body absorber, but if it was a perfect back body absorber, it’s temperature would be completely determined by the incoming amount of solar energy and Stefan-Bolzmann’s law. This temperature is the highest temperature that Earth can be at, if incoming solar energy is the only energy source. Greenhouse gases in the atmosphere make Earth more of a black-body and so Earth’s temperature will rise a bit. The exact mechanism used to move the energy back to the universe isn’t important for the maximum possible temperature. Note quite. You need to define what you mean by “Earth” – strange as it may seem. The incoming solar radiation is balanced by the outgoing radiation from the earth’s climate system. This is the important balance for determining the “effective radiation temperature” of the climate system. We measure this radiation (by satellite) – it is about 240W/m^2. If we convert it to a blackbody temperature it is around 255K. Think of the climate (earth, ocean, atmosphere) as one system. The whole system is in approximate balance. This by itself doesn’t tell you what the surface temperature will be (or the center of the earth). It just tells you how much radiation is sent out into space. Not really. The surface temperature is determined by the energy balance between the surface and the top of the atmosphere (TOA). The TOA is in balance with the solar radiation. More (or less) GHG’s change the relationship between the surface and TOA. Suppose you feed 50,000W into the house via solar or internal heating (or a combination). If the whole house is in approximate balance then 50,000W will be leaving the house via radiation and conduction. But armed with this information you don’t know what the temperature of the lounge will be. Could other physical factors be a play here or is the heat budget more complicated then theory portends. Empirical data show a different scenario. I don’t quite understand how satellites can show the average heat budget over a broad diverse albedo topography of the Earth of 30% land and 70% water. That’s what it takes to change the temperature 1 degree K.
When CO2 changes from 1 to -1 C, a change of 2 degrees C, it radiates 2(0.189 kJ/kg) = 0.378 kJ/kg. When water vapor changes from 1 to -1 (and condenses) it radiates 2257 kj/kg + 2(0.462 kJ/kg) = 2257.524 kJ/kg. It does this every single time you see a cloud. But CO2 has no phase change so it carries no heat: All gases at the same temperature have the same number of molecules per unit volume. or that water vapor in the example carries 50,479.50 times more heat than the CO2 does. And that’s just rain. If it turns to snow- multiply by 5-6. Conclusion – the CO2 is insignificant retainer of heat in our atmosphere. Water vapor does 50,000 times more work. I think McK has a point here that water vapor is the big elephant in the greenhouse room. Why else do deserts get hotter and colder than temperate zone? Why do ocean current have a significant effect on nearby land masses? Why has ocean increases been relatively steady for the last 2 centuries? And could solar influences have more of an effect than previously assumed? Solar energy is not uniform, it has components of ultraviolet, xrays, light, and IR. NASA has indicated that the total quantity has not been adequately picked up by existing satellite sensors. So where has the forcing gone in the last decade plus? If CO2 forcing is what it’s alleged to be then why does this happen.. This post isn’t about attributing anything, it just explains the basic theory of how more radiatively-active gases can change the temperature of the surface “all other things being equal”. Do you mean the heat budget or the temperature? If you are talking about temperature – which is what they do measure – different wavelengths are used for different types of measurements. The same approach (measurement of different wavelengths) is used to measure the temperature of different layers in the atmosphere. When CO2 changes from 1 to -1 C, a change of 2 degrees C, it radiates 2(0.189 kJ/kg) = 0.378 kJ/kg..
There’s a mishmash of ideas in what you write making it difficult to know where to start. Water vapor condensing releases lots of heat. This is correct. However, comparing the specific heat capacity of CO2 and water vapor is not going to help. If that was the one important ratio for how the atmosphere functions then you would be right. But you can’t just divide two numbers and hope for the best. How much energy is carried from the earth into the atmosphere by latent heat of water vapor? How much energy is radiated from the surface of the earth out to space? How much of this energy is absorbed by the radiatively-absorbing gases, like CO2 and water vapor, in the atmosphere? If you calculate how much rain falls to the earth you can find out how much latent energy was carried up in the first place (what comes down, must have gone up first). It turns out that the energy carried by latent heat into the atmosphere is very approximately averaged at 80 W/m^2 (global annual average). This is substantial but not nearly as much as is radiated from the earth’s surface (396W/m^2) or absorbed in the atmosphere and re-radiated back to the surface (324 W/m^2). Water vapor has a very strong impact here as well. And in this case it is nothing to do with its latent heat – it is the ability of water vapor to absorb longwave radiation. Surely any discussion of the earth’s energy budget should mention the contribution from the earth’s core? Small amounts of the earth’s core energy are conducted up to the earth’s crust. However large amounts of energy (and gases) are released by volcanoes and equally large amounts of energy are released by earthquakes. I note that the surface energy released by the 2004 indian ocean earthquake was 1.1×10^17 J which is close to the total energy from the Sun that strikes the face of the Earth each second 1.74×10^17 J (so the earthquake could be considered to have a negligeable effect on the earth’s energy budget). However the total energy released by the 2004 Indian Ocean Earthquake is estimated to be 4×10^22 J compared to the total energy from the Sun that strikes the face of the Earth each day 1.5×10^22J. Thus the total energy contribution of this single event is probably not negligeable for the earth’s energy budget. There is a tendency to classify of earthquakes in terms of the energy released on the Richter scale however it seems that the work done in displacing the earth’s surface significantly increases the numbers (10^17 -> 10^22 from the example above). Looking at the yearly occurance of earthquakes and an estimation of their energy release I get a very (very!) rough estimation of 1×10^18 J/year which is tiny compared to the sun’s contribution of 5.5×10^24 J/year However, the total work done by these earthquakes is liable to be significantly larger bearing in mind the Indian ocean earthquake example above. I think the earthquake/volcano combination potentially involves enough energy to have an influence on the earth energy balance. Thanks for the great blog! I’d be ever so grateful if you could help me please with some pointers for the following questions related to this post. Held and Soden 2000 has the following comment: “The increase in opacity due to a doubling of CO2 causes Ze to rise by ~150 meters. This results in a reduction in the effective temperature of the emission across the tropopause by ~(6.5K/km) (150 m) ~1 K, which converts to 4W/m2 using the Stefan-Boltzmann law.” I can see how to convert between these different numbers – 150m, 1K and 4W/m2 – but what I can’t quite see is how to get to any one of them in the first place. Is this done using a computer? What is the basis for the calculation? I noticed in F.W. Taylor’s text book (section 7.6.2), a simple model that gives a value for rise in Ze of 3 km! Why the big discrepancy compared with the value given in HS? You’ve got a nice diagram containing the tropospheric temperature profile in June at 45N. How does this profile vary with latitude and season? What does the temperature profile look like when there are lots of tall cumulus clouds or during a thunderstorm? Apologies if you’ve already answered these elsewhere and I’ve missed them. If it’s easiest, please send me off to do some more reading — but I only have access to publicly available journal articles. Sorry, one more question occurs to me…. Probably not practical, but has anyone attempted to estimate Ze experimentally perhaps by combining measurements of temperature profiles and albedo? The first number (150m) is calculated using the radiative transfer equations (RTE) – there isn’t a simple relationship that can be applied. These equations can only be solved numerically on a computer. If you take a look at the Atmospheric Radiation and the “Greenhouse” Effect series, especially Part Six – The Equations and also Part Nine you will see the basis for the RTE. The 150m converts into ~1K simply from the lapse rate (0.15 * 6.5). Note that this is a “no feedback” calculation, which is why the lapse rate is assumed constant. The 4 W/m2 can be seen very approximately from E=σT4. But in practice the real calculation of radiative forcing is done using the radiative transfer equations – these are not linear so whereas the peak of the CO2 band is radiating from up in the stratosphere, other parts of the CO2 band are radiating from lower in the troposphere, and so on. Armed with a temperature profile and the concentration of radiatively-active gases, from before and after, the RTE produce a “change in upwards emission”. Because he is demonstrating a very simple model. Good question and a reasonable sized topic. Something I will have to cover at a later date, because it requires pulling information together from various sources. In general the lapse rate is a higher value at higher latitudes and higher altitudes – due to less water vapor being present. The dry adiabatic lapse rate is around 10 K/km, but the most moist adiabatic lapse rate is under 4 K/km. Thank you very much for your kind reply. I will educate myself some more regarding the RTE. This whole site is pretty extensive.. and I have not read it all. However I got interested in deriving the temperature profile for an atmosphere uniformly semi-opaque to IR and transparent to solar energy, for my own benefit. I have been able to get the temperature at the top of the atmosphere, at ground , the discontinuity at ground and the profile with altitude for emissivities independent for density (or for a constant density fluid).. and then I got stuck, I need to read more. 1) Are there good links to information online on the development of a gray atmospheric model?. I looked up some of the references (Goody etc.) and these books are $90 plus, the research papers are $25 to download. Its unfortunate but I am not in the position to spend near $1000 just for an intellectual hobby. The next step I am looking for is how to include the density into the emissivity and then integrate it closed form. I know It can be done numerically, the excellent rte programs by SOD (which I am still learning about) help do that.. but I am really curious about the close form results others have come up with and how they went about it. 2) Is there a better post or subforum in here to talk about the gray atmosphere model? if so I would post there. 3) Is there a good number for the blackbody temperature of the earth (and what is the proper name for it?). What throws me for a loop and want to understand better is that Miskolzci indicates that equations 1,2,3,4 are for an unbounded atmosphere and proceeds to develop other equations for a bounded atmosphere. But my equations where derived for a bounded atmosphere with a finite height, and a finite temperature at the top layer, so I don’t follow his comment that they are for a semi-infinite atmosphere. I guess my own derivation is more relevant to a tall glass of fluid like a copper sulfate solution at constant density. Sorry for the long post. Thanks for an excellent forum. Have you read the Miskolczi threads here ( https://scienceofdoom.com/roadmap/miskolczi/ )? There’s a lot of detail in the comments. The problem with gray atmosphere is that energy is redistributed over the entire spectral range at each altitude. The real atmosphere doesn’t behave that way. The molecular lines do change width so the atmosphere is grayer near the surface, but having a spectral range where there is little or no absorption (the window) does make a difference. For one thing, it helps remove the temperature discontinuity at the surface. I think there’s a link to a free copy of a Ramanathan(?) paper that talks about that buried in there somewhere. The article considering the “semi-gray atmosphere” is The Mystery of Tau – Miskolczi – Part Five – Equation Soufflé. The article does include the mathematical derivation in the comments. Unfortunately from your perspective the article is written around the confusion of Miskolczi rather than from the “introduction to grey atmospheres” approach. You might find some of it useful. However, trying to understand the Miskolczi approach is not recommended except for people who like to invest uncountable hours on stuff that is wrong. As DeWitt Payne said, there is a link to a free Ramanathan paper. This is an excellent paper – Deductions from a simple climate model: factors governing surface temperature and atmospheric thermal structure, Weaver & Ramanathan, JGR (1995). You could say that what they are trying to do is extend the models (which have analytical solutions) as far as possible – the semi-grey approximation is very limited – but even with their improvements, which provide good insight, their model is still extremely limited. Of course, they don’t claim to have overturned anything in atmospheric physics, only extended the range of a teaching model. You might be thinking of the “effective radiating temperature” of the earth. This is simply the actual radiated flux (outgoing longwave radiation) converted into a blackbody temperature. However, I recommend avoiding this altogether and just using the radiated flux. Armies of people who have learnt their climate science in blogs are convinced that the shorthand convention called “effective radiating temperature” which is widely used, actually means that climate science assumes everything radiates as a blackbody. The radiated flux globally annually averaged = 239 W/m2 or thereabouts. If we made the heinous mistake of converting it into the convenient shorthand of “effective radiating temperature” it comes out to 255K. So I’m not sure exactly what you are looking for. Do you want to compare the radiated energy from the surface of the earth with the top of atmosphere value? I’m in discussion with someone who doubts AGW and he is saying that satellites such as ERBE are showing that the amount of LWR radiation escaping the TOA has increased over the past 30 years. I’ve looked at the satellite data and they appear to show this increase, which seems to contradict this post. How is this so? Am I missing something or failing to interpret the data correctly? I’m doing my best to understand all the science but I’ve less science background than most on a site like this. Can anyone give me a reasonably quick answer. Without looking at the numbers myself, the first question you should ask is if the increase is significant considering the precision and accuracy of the measurements. You have different satellites measuring over relatively short time spans separated by ~15 years. Looking at TOA flux alone could be misleading as there are other factors that contribute like albedo variability. That’s not to mention that the conversion of the radiance measurements to TOA flux is still a work in progress. Can you supply a link to the data you’re looking at? Your right, it conflicts and this site is off base. It’s important to understand the key principles at work as well. Let’s say that solar radiation absorbed by the climate system hasn’t changed over 30 years. For now, it’s an assumption to illustrate a principle.. So if the OLR (outgoing longwave radiation = radiation emitted by the climate system) has increased then the earth has been cooling. And as a first approximation there are three ways the OLR could increase. First, the opacity of the atmosphere has reduced – in simple terms, allowing surface radiation to escape more easily. You can look at the second and third ideas as perhaps redistributing total heat within the climate system to allow it to be more effectively radiated to space. Hopefully the above points make sense. If the earth is warming we would either expect the cause to be a higher absorption of solar radiation or a reduction in OLR (or both). Of course, if we just considered the surface warming it might be a redistribution of heat from the oceans. But as best as we can tell, the ocean heat has also increased over the past 30 years. And finally, it is also important to remember that even if the earth was not heating up or cooling down the earth would still not actually be in a radiative equilibrium – this is more a useful approximation. Over one year or one decade there will be a small imbalance in one direction or the other due to the “random” fluctuations of climate. So with surface temperature fluctuations from month to month and year to year we don’t expect to see a perfect flat line – or a monotonic trend. Thanks for the quick and easy to understand reply. The link I looked at was at the NOAA web site. You can create a NOAA Interpolated OLR GrADS image for different time periods. If I make one for the period of June 1974 to June 1980 it shows a map with areas divided by contour lines of OLR values. The minimum is 114.111 and the maximum is 290.586 w/sqm. If I do the same for June 2004 and June 2010 ( another 6 year period) the map has a max 302.207 and a minimum of 114.117. Upon closer inspection the various contour there doesn’t seem to be much difference in the values but it’s obviously a gross . What I’m wondering about is that maximum number. I recognize that what I’ve done is likely a ridiculously simplified examination of the data, but I don’t have the expertise (or time) to learn or go through it all. It just seems if I create visualizations for different six year periods (no idea why I picked 6) as the years advance the maximum gets higher. The NOAA website data may be “reanalysis data”. For explanation of reanalysis, see the subheading Reanalysis – or Filling in the Blanks in Water Vapor Trends. I’m not certain this data is reanalysis.. but if it is – reanalysis data, while very useful, can be problematic for assessing long term trends, especially over multiple instruments. Detecting long term small trends isn’t the main use or the strength of reanalysis. Comments from other commenters on this dataset? E.g. PSD Climate and Weather Data linked by the original page from Wayne. There are probably some papers on long term OLR trends and this might be an interesting subject for an article. I did start writing one a while ago on TOA energy balance but got bored with it, because a lot of the substance needs to be about error analysis. Hard to stay awake. You can plot data yourself by visiting the CERES data page. From that webpage I could export the monthly data, so calculated the mean annual OLR from 2001 – 2010 (2000 excluded because data only available from Mar-Dec for that year). As you can see, variability year to year, but no discernable trend over this 10 year period and definitely not an increasing trend. This is about accuracy – considering that ERBE was followed by CERES.. While the radiances from instruments like ERBE and the Clouds and the Earth’s Radiant Energy System (CERES) are stable to a few tenths of a W/m2 per decade (Loeb et al. 2007a) and provide excellent regional coverage of the distribution of reflected solar and emitted thermal radiation from the earth, the absolute calibration is known to 2% in the shortwave (SW) and 1.5% in the longwave (LW) at the 95% confidence level. Instruments that measure total solar irradiance, such as the Solar Radiation and Climate Experiment (SORCE) instrument (Kopp et al. 2005), are also far more stable than they are absolutely accurate. Consequently, it is not surprising that satellite observations produce larger net TOA flux imbalances than expected. And reviewing other papers, like Clouds and Earth Radiant Energy System (CERES), a review: Past, present and future, Smith et al, Advances in Space Research (2011), it seems that the two major satellites didn’t have coincident periods so that they can be compared for absolute accuracy. Two CERES instruments, Flight Models 1 and 2, went into orbit on the Terra spacecraft in December 1999 and began operating in February 2000. These satellites are at 705 km altitude, so that the footprint is nominally 20 km. These instruments are still operating as of the time of this writing, each having yielded a decade of measurements. In March 2000, PFM was turned on in order to get measurements to compare with FM-1 and FM-2 and operated until data from PFM became too noisy to be useful, slightly longer than 1 month (Szewczyk et al., 2002). Two more CERES instruments, FM-3 and FM-4, were flown on the Aqua spacecraft in May 2002 and began providing measurements in June 2002. FM-3 continues to operate well. FM-4 provided data for over two years, after which the shortwave channel failed. The Earth Radiation Budget (ERB) instruments which flew aboard the Nimbus-6 and -7 spacecraft provided the first broadband measurements of Earth’s radiation budget. They gave data from 1975 through 1987.
studies. CERES instruments now on spacecraft and in the building phase should give data for another decade, nearing a half-century of climate data. SOD and DeWitt: thanks for the responses. I think I broke through where I was stuck. I seems that if the transmissibility has the form e^-ko*rho*dL then if I define layers of the same mass (equipartition of the total mass) then I get the same equation form I had before, and the same answers for the temperature at the top of the atmosphere, at the bottom of the atmosphere and at the ground. The difference from a constant density atmosphere is that the altitude is different function and consequently the lapse rate is different. Its mind-boggling. This implies that (at least for a grey atmosphere) it doesn’t matter what the distribution of the density is, or the temperature profile or the pressure profile. As long as the total mass is the same, the temperature at the ground will be the same since ko is constant. The temperature at the ground for a given Solar input is solely due to the total optical thickness not the temp or pressure profiles. Thanks for the link to the Ramathan paper. So far its over my head and talks about improvements on the grey model. It provides some answers I can check mine against, it will take a (long) while for me to digest it. In retrospect, equipartitioning the mass like I did is the same as equipartitioning the total emissivity geometrically or equipartitioning tau, that’s probably why Ramathan integrates versus tau and not versus height. “Do you want to compare the radiated energy from the surface of the earth with the top of atmosphere value?” Yes. I was wondering if it could be roughly estimated from a spectrum like figure 2.9. Yes, I know a grey model is only a crude approximation, its just I was impressed with Miskolczi, Goody and others that can represent a complicated thing like the atmosphere with a few global equations. I just thought it was cool. I have long ways to go, and way down the line I would like to try the effects of H2O and CO2 increasing the optical thickness. I will move now to the ‘equation suffle’ posts as you suggested. Understanding the interaction of radiation with the atmosphere is a difficult topic. Like any new topic my recommendation would be to try and work through more than one textbook which explains the subject. For myself I usually find one textbook leaves me confused on some points. I’m the kind of person that can’t quite make progress until all aspects are clear. A blessing or a curse? I’m not sure which. But multiple sources usually help to clear up the mysteries. If you have the benefit of a university library I recommend seeing the cost of joining to be able to borrow books and then in their climate section find a book introducing atmospheric physics. Then definitely recommended and worth its price many times over is A First Course in Atmospheric Radiation, by Grant Petty which you can find reviewed in Find Stuff Out and Book Reviews. It can. This spectrum can be numerically integrated to calculate the TOA flux. The value is already known from the average of all of the satellite measurements of total flux, and is about 239 W/m2. I have a question regarding emissivity. Given a climate sensitivity lambda (as defined in IPCC 2007) and the incoming radiant flux (say 236 W m^-2) , one can calculate the inferred effective emissivity from the Stephan-Boltzmann radiant balance law. Using lambda=.986 K m^2/W per the cenral value in IPCC 2007 and confirmed in many sources, the effective emissivity comes out to be only .564. I’ve seen some sources that seem to indicate this is correct (or at least it might be as low as .64) and some that say it should be close to 1. Can you shed any light on this subject? Thanks. I can’t understand the proposed relationships between these numbers. How are “effective emissivity”, λ, and the incoming absorbed flux related? I used the term effect e because its value comes from the so called zero dimensional model. In a multi-layer atmosphere there is an e for each layer. But it strikes me as odd that the effective emissivity would come out so low, just 10% or so above what we’d expect from a planet perpetually shrouded in cloud cover. Another odd thing is that if you use e=.564 to calculate the surface temp given Trenbeths energy budget, you get a very hot planet! e=1 gives the correct result. I’m trying to understand this apparent inconsistency. Small problem, emissivity isn’t a variable. When you calculate Teff, ε ≡ 1 If it were a variable, then you have to use the chain rule to differentiate. But then you have an additional unknown, dε/dF, because you don’t actually know how ε depends on F. Even if your calculation were correct, you still can’t use that ’emissivity’ to calculate the surface temperature from the S-B equation. λ = ΔF / ΔTs …. How do we link together the variables you identified? We can suppose there is a linear relationship between Ts and Tc if that helps. We should assume ε and γ are functions of temperature. Which is where I think you got your relationship from? Actually the I used the zero dimensional model and solved for the boundary condition at the surface but I get almost the same answer using your approach which I like even better because it better models the atmosphere. K = 1/(4εσ Ts3 ) ……. λ = K/(1- b K) where b is the feedback “gain”. IPCC estimates b=2.16. Alternately if you know λ and b you can solve for K and from K solve for ε.
I forgot to post the conclusion, Using your TOA approach I get ε=.774 and λ=.492. While setting K=.313 (λ =.966) and solving gives ε=.590). Your equation 1 is correct assuming we change notation slightly from my earlier comment, including ε = emissivity of the atmosphere (rather than the whole climate system). [Solar energy absorbed by the atmosphere and earth] + [Energy radiated downwards by the atmosphere] = Energy radiated upwards by the surface. What is the basis for this relationship? Conservation of energy? If so, it is not correct. [Upwards radiation from the surface] + [Sensible and latent heat net from the surface to the atmosphere] = [Solar radiation absorbed by the surface] + [Downward radiation from the atmosphere absorbed by the surface]. In the case of my equations I allowed an assumption of a linear relationship between the surface and the atmospheric temperature simply to see what happens. I don’t believe there is such a relationship on theoretical grounds but it is probably one of the simplifications that should be made in a simple model – to see what we can learn from such a simplification. You can see the results of some very simple assumptions in Simple Atmospheric Models – Part Two and in the preceding article to that. Thank you for your reply. Before I respond let me say that I’ve been perusing your site and it is by far the best on climate science I’ve seen and I’ve seen them all. So many want to grind their axes on the heads of those who simple have questions or who like to work things out for themselves. You answer all with patience and clarity. Well done and much appreciated. Equation 2 comes from some old undergrad Thermo notes I dug up. I poked around last night and found a similar treatment in an online reference here which appears to be a college text book used at UT. See section 2.3.2. Note he takes e as absorption. Replacing e with 1-ε and rearranging a bit I can get both eqs 2 and 3 above. Math aside, I’m trying to understand how Hansen and others arrive at what they call the no feedback sensitivity k (BTW you seem to have these terms inverted in your blog on climate sensitivity. λ and k should both have units K m^2/W). I think (but am not sure) that the missing terms you point to can be treated as feedback and so can be ignored for deriving k. In any case lets ignore them for now. The main thing I want to verify is that they derived k in situ. In non-linear dynamics it is critically important that when ascertaining the feed forward, small-signal gain, you do so at the operating point that gain will see at equilibrium. This is usually very tricky but if one simply breaks the feedback loop (heuristically or experimentally) as one might in a linear system analysis, you’ll be lead badly astray because by definition, the forward gain is a function of its input value in a non-linear system. In any case, at this point I’m just trying to build a simple mental model and checking my results against reality as I add complexity. I ran into this unexpectedly low value for ε and realized something’s off. Does the low effective ε surprise you? If we were a space observer calculating earth’s temp from its TOA near blackbody temp, I doubt one would estimate that you’d need to use ε=.54 to get the surface temp based on observation of our blue ball. ..Equation 2 comes from some old undergrad Thermo notes I dug up. I poked around last night and found a similar treatment in an online reference here which appears to be a college text book used at UT. See section 2.3.2. Note he takes e as absorption. Replacing e with 1-ε and rearranging a bit I can get both eqs 2 and 3 above..
You can get those equations if you start with different assumptions. (You can see similar derivations in the links I provided earlier). This model is used for illustration and conceptual understanding. For the more real-world model we are discussing equation 2 is not correct. The atmosphere absorbs some solar radiation. The atmosphere is not isothermal. Convection takes heat from the surface into the atmosphere. For an approximation it turns out to work quite well. Assume y S is constant i.e. y S = Fo so that the temperature depends only on ε.
Kg = d Ts / d F = 1 / (4 σ ε Ts3) …. Wow. That came out better than expected. For Ts=288 and Fo=239 Kg=0.3013, very close to the accepted value. Note that the positive correlation of Kg with Ts does not imply runaway. just gives the no feedback gain for small perturbations around a particular Ts. d(Kg)/dTs = 3/(Fo Ts) which shows the sensitivity decreases with Ts as expected. I did not read every word of this long discussion, but nowhere in what I did read did anyone deal with the heat sources within the Earth. Treatment of the Earth and its atmosphere as a “closed system” that seeks a balance temperature at which incomiing solar equals outgoing energy needs to account for the internal source. It’s usually not discussed, because it’s both very small and essentially constant. The heat from the interior of the Earth is roughly 1/4000 of the incoming solar radiation. A change of this magnitude to the energy balance would not be insignificant, but as a constant contribution the effect is much smaller than other uncertainties in the constant parts of the energy balance. to illustrate why CO2 in the atmosphere can never make much difference. Radiative emission of 240 W/m2 from ground directly to outer space through “fully open atmospheric window” with emissivity 0.7 at 280 K = 7 C according to Stefan-Boltzmann 240=0.7×σ×2804 with σ=5.67×10−8Wm−2K−4. We compare with present observation of ground temperature of 15 C with emission of 40 W/m2 directly from the ground to outer space, with thus “1/6-open atmospheric window”. Extrapolation to fully closed window, then predicts a ground temperature of 15+ 8/5 C, say 17 C.
I found this article from the always great Science of Doom, which is much clearer and comes to a very different conclusion. Does anyone have any insight as to what is wrong with the conclusions above, if it is even decipherable. Joe: It is worth remembering that Klaus is a mathematician, not a scientist. Mathematicians postulate a set of axioms and then make a series of logical deductions/theorems from them. Testing those theorems to see if they are consistent with observations is what differentiates science and the scientific method from mathematics. One can postulate that zero, one or many lines can be drawn through a point not on a line and parallel to that line. All three possibilities are valid fields of study and none was “invalidated” by experiment. General relativity came along much later demonstrate that non-Euclidean geometry had some utility – that it made useful predictions about how things behave. Given the century of increasingly sophisticated experiments that have been performed since the QM and relativity revolutions, there is little chance that Klaus’ mathematical postulates about radiation will be at the heart of another major revolution in physics. In my experience, Klaus never discusses situations where his postulates and established theories make different predictions and what experiments might be performed to decide which is correct. Challenge you friend to show Klaus applying the scientific method to determine whether conventional theory and his alternatives are correct. 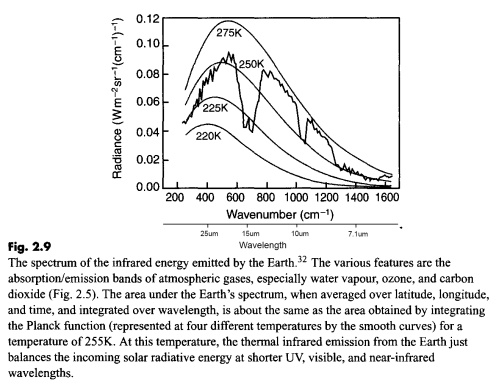 1) Radiative absorption of 240 W/m2 out of incoming 340 W/m2 from the Sun with absorptivity 0.7 by Earth+atmosphere system. 2) Thermodynamic transfer of 240 W/m2 from Earth+atmosphere to Earth ground surface (without loss). 3) Radiative emission of 240 W/m2 from ground directly to outer space through “fully open atmospheric window” with emissivity 0.7 at 280 K = 7 C according to Stefan-Boltzmann 240=0.7×σ×2804 with σ=5.67×10−8Wm−2K−4. Unfortunately, none of these postulates agree with observations: 1) SOD has pointed out that the emissivity of the earth’s surface is not 0.7. With the right assumptions, one can come up with an emissivity* for the earth/atmosphere system WITH GHGs of 0.7, but the emissivity of the surface with no interference from GHGs is well above 0.9. 2) 280 degK is simply the temperature needed to emit 240 W/m2 from a surface with an emissivity of 0.7, not a figure based on observations. 3) WIthout GHGs, we wouldn’t have clouds and the earth’s albedo (1-absorptivity) would be much lower. 4) No mechanism is given for step 2). To be fair, those who claim that the GHE is 33 degK also make some dubious postulates when modeling an earth without GHG’s. Ignore dubious models. The surface emits an average of about 390 W/m2. About 240 W/m2 leaves the top of the atmosphere. That difference is caused by GHGs (colder than surface temperature) absorbing and emitting photons. If the difference were smaller, the surface of the earth would be cooler. *The concept of emissivity can be tricky when applied to gases or transparent materials. When you are dealing with a homogeneous isothermal object and a single wavelength, emissivity is simply the ratio of observed emission to blackbody emission. Usually we integrate the output over all wavelengths and calculate emissivity in terms of the total power emitted compared with a blackbody at the same temperature. This definition is sometimes applied to the earth-atmosphere as a whole, ignoring the fact that it isn’t homogeneous and has temperatures ranging from 210 to 310 degK, nearly a 5X difference when you raise temperature to the fourth power. The emissivity of the earth’s surface varies but is not 0.7. I assume that is what the statement you cited is saying. The emissivity of the ocean, covering over 70% of the surface of the earth is about 0.96. See Emissivity of the Ocean. So even if the emissivity of the land area was 0.0, which is isn’t, you would be almost at an average emissivity of 0.7. Various blogs are confused about the greenhouse effect. Once these blogs finally figure out that the 240 W/m2 globally annually averaged radiation at top of atmosphere doesn’t match the surface temperature they invent surface emissivities to try and reconcile the observations with “no greenhouse effect”. I can point you to some hilarious blog articles if you like..
Claes “marketing genius” Johnson is in a little bit of a different category. He doesn’t believe in the photon. Radiation theory – as it has been understood for the last 100 years or so – is not correct. So he claims. His marketing genius is to not explain this to his many admirers, who believe he has found a flaw specifically in climate science, rather than a flaw in basic radiation theory. I’m not particularly interested in debating whether basic physics is correct, as outlined at the end of the Etiquette. If we accept into evidence that basic physics textbooks are correct, then the measurements of radiation with pyranometers and pyrgeometers are correct, the Stefan Boltzmann equation is correct, and measurements of emissivities are therefore meaningful, verifiable and can be demonstrated to be correct. If you go back to Claes’ blog and bring up emissivities, he will then tell you that pyrgeometers have problems, and .. long story short.. eventually you will realize that you are debating a subject with someone who doesn’t believe a surface emits radiation and also absorbs radiation. There are no photons.. But please, the “no photon” thing.. we don’t want to discuss it here.. This statement is not quite right. If you have 100% transmittance you can have no clouds and clouds are responsible for a great deal of the albedo. The real albedo would be 10 to 20%, meaning more absorbed power from the Sun, and the temperature would be 267K or -6 celcius. Besides that i have a question of how clouds influences the effect of GHG’s. Clouds have their own effect on the radiation balance, but they also shadows for the outgoing radiation (all else equal). There wouldn’t be clouds because, for the atmosphere to be transparent, you can’t have water vapor. No water vapor means no clouds. But you’re right, the albedo would change too. However, by convention, we assume that the albedo is still 0.30 for this sort of thing. The effect of clouds is controversial. It’s quite clear that the distribution of clouds that exists now cause the surface to be cooler. They reflect more incoming radiation than they reduce radiation emitted. Note that’s reduced. Cloud tops emit LW radiation with an emissivity very close to 1. If you use MODTRAN, it shows that, for example, the tropical atmosphere with a clear sky emits 289.225 W/m² to space. Add Cumulus clouds and the emission only drops to 261.97 W/m². Cumulus clouds reflect a lot more than 10% of incoming solar radiation. But some types of clouds, particularly high cirrus clouds, may increase surface temperature. Clouds of ice crystals can reflect LW IR. Using MODTRAN again with the tropical atmosphere but at the surface looking up, for clear sky, the surface sees 347.912 W/m² incoming LW IR. Add the NOAA cirrus model clouds and that increases to 350.11W/m². Most climate models have clouds as a positive feedback long term. I don’t think that’s correct, but that’s just my opinion. The problem with models is compounded because models don’t do clouds very well at all. The grid resolution is nowhere near fine enough. I know that clouds are a big joker in the climate and global temperature, but my question was how clouds may change the outgoing LW radiation by simply shadowing it like clouds shadow the incomming sunshine. In the so called window they reduce the amount of IR that goes out, like they shadow for the Sun. The radiating effect of clouds itself must depend on the base temperature and top temperature, but that is independent of its shadowing effects for both sunshine and IR. Then i ask how much is the incomming sunshine reduced by cirrus clouds? It is a question of dividing the effects to some parts where you can say something with confidence. With the sky covered by clouds, there is very little radiative energy transfer from the ground to the clouds or vice versa. The energy transfer is by convection only. Tropical atmosphere cumulus clouds, surface looking up: 418.248 W/m², surface looking down: 417.306 W/m². I’m not sure of the reflectivity of cirrus clouds for solar radiation or what percentage of the sky is covered in the different cirrus cloud models. But there is a setting in MODTRAN for sub-visual cirrus clouds that still increases DLR by 0.3 W/m². Could anyone tell me what the reference is for the “Outgoing Long Wavelength Radiation” plot by Taylor, 2005? (Fig 2.9 above) In particular I would like to know how high the satellite/satellites are. I have looked and looked for this. on December 28, 2016 at 9:08 pm | Reply Mike M.
I think the trick is knowing what the satellites are called. The source is a book, Elementary Climate Physics by Prof FW Taylor. I don’t own the book, I borrowed it from the university library, so I don’t have his source. The CERES instrument doesn’t give a spectral graph like this – it has shortwave (0.3um – 5um), total radiation (0.3um – 100um) and the “atmospheric window” (8-12um). The shortwave will give you reflected solar radiation and the total minus shortwave will give you emitted longwave radiation. AIRS is another modern instrument (on the same satellites as CERES) that does give a spectral breakdown – with the infrared spectrum in 2378 individual frequencies. The Infrared Interferometer Experiment on Nimbus 3, Conrath et al (1970) is the source. The Michelson interferometer experiment carried on the Nimbus 3 satellite has successfully obtained thermal emission spectra of the earth and atmosphere between 400 and 2000 cm−1 with a resolution equivalent to 5 cm−1. Comparison of a measured spectrum with a spectrum calculated theoretically from near-simultaneous radiosonde measurements indicates generally good agreement over most of the spectral range covered. A preliminary search for spectral features attributable to minor atmospheric constituents other than CO2 H2O, and O3 has resulted in a positive identification of only CH4 thus far.. I don’t know much about the Nimbus satellites – wikipedia article. You can see a number of measurements of OLR in Understanding Atmospheric Radiation and the “Greenhouse” Effect – Part Ten. I can dig out more sources if you like. .. but I can email the paper if you are interested. My email is scienceofdoom you know what goes here gmail.com. However, it is a lot about the technical aspects of the interferometer that allows for the measurements across the spectrum and overall very technical. It is very interesting Indeed. It shows how the surface only heats the air that is directly above it to the same temperature. 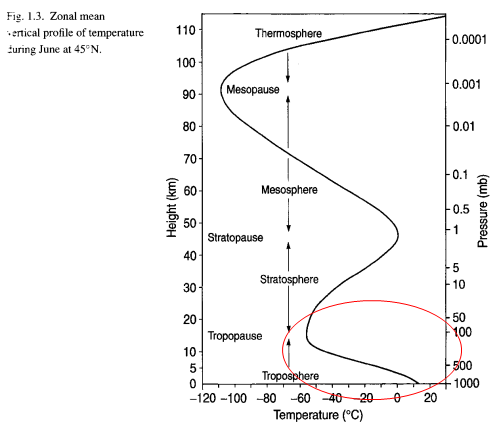 The rest of the troposphere gets so little heat that the temperature drops by ~70 degrees in 10km. At the tropopause we see that the temperature is that of dry ice, co2, emitting according to a temperature of 210-220K, which is the temperature kept into the stratosphere where it starts to rise. What I see is how co2 is a “cold lock” for the troposphere. It looks as it is what keeps the temperature at that low level at high altitudes. You can count all the photons you want, the spectrums and the gradient clearly show how co2 cools the atmosphere and keep it cool. Dry ice absorb heat like a boss. How did you come to the conclusion that adding a powerful heat absorber in a situation where thermal energy is constant and limited, will cause increasing temperatures? More cold molecules absorbing the same amount of heat means less heat per molecule, and that is the definition of lower temperature.